Bread, considered the most-important category within the baking industry, is one of the most challenging areas for building noticeable market growth. A reputation often tarnished by no or low carbohydrate diets, and a consumer focus on gluten-free products, has created a challenging environment for today’s bread manufacturers. The good news is that bread, and in particular “artisan” bread, is back! Consumer’s desire for hearty “artisan” bread has returned once again, in a romantic, renewed appreciation and much deeper understanding that has not been seen over the past two decades. One reason for the growing consumer attraction back to bread is its ability to give the illusion, at least for one meal, of a slower, simpler, more leisurely lifestyle. Is There a Definition for Artisan Breads? With such a broad and undefined definition for the term “artisan” bread, this provides manufacturers with an opportunity to introduce new concepts to the market. For example, with consumer acceptance of increased protein as a health-enhancing choice, several Canadian bread manufacturers have explored the option of producing protein-enriched artisan-style breads. To create protein-enriched artisan breads, manufacturers have typically focused on adding whey, soy or pulse proteins. Although, this has resulted in an improved ingredient profile, whey and soy are known to contain allergens. Unlike whey or soy, Profi Bake, recognized by food technology magazine as one of the new plant proteins impacting the culinary landscape today, does not contain any ingredients that fall under the top eight most popular allergens. Profi Bake is an award-winning complete high protein plant-based composite that has been specially designed to manage water in baked goods. Its light-coloured soft powder form enables Profi Bake to act like gluten-free flour but with the added nutritional benefits of dietary fiber and protein. With a PDCAAS level of 0.97 +/- 0.08, PER score 2.4 +/- 0.2, Profi Bake can enable manufacturers to make fiber and protein claims on their bread products as well. Profi Bake does not contain any soy, egg or dairy and in fact none of the top eight most popular allergens. Profi Bake is also Non-GMO Project verified, Kosher and Halal certified providing the quality assurance today’s health-conscious consumers are looking for. With ingredients playing such an important role in the development of artisan bread, it is important to have a trustworthy ingredient supplier who has the proven expertise, knowledge and experience. Dealers Ingredients, with over 43 years of experience supplying ingredients to the bakery industry and the manufacturer of award-winning ingredient Profi Bake, has the expertise and knowledge to assist manufacturers looking to create high protein artisan breads. 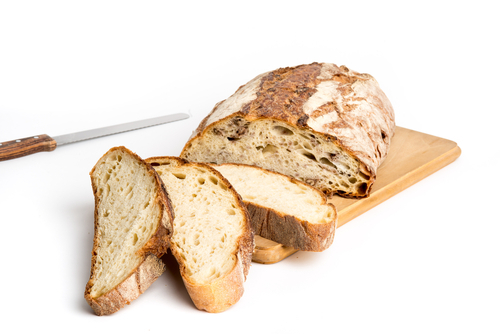 Interested in learning how to create your high protein artisan bread and bring it to market faster? Contact your Dealers Sales Consultant or call us at 905 458 7766 or info@dealersingredients.com for information, samples, recipes or assistance in creating your customized high protein artisan bread concepts. In addition to Profi Bake, Dealers Ingredients has a wide selection of ingredients that are suitable for use in the creation of other bakery items including Butter Buds functional flavour ingredients, Hydrosol stabilizers and texturizers, award-winning Profi Pro and Natralein pea and brown rice proteins. Conventional and organic varieties are available on select options. Dealers Ingredients is the exclusive Canadian distributor of Butter Buds and Hydrosol as well as the manufacturer of Profi and Natralein branded ingredients.